Mar. 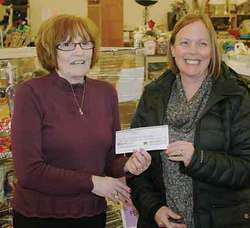 27, 2014 5:00 p.m.
Linda Blumenthal (on left) from Second Glance presents a cheque for $2500.00 to a beaming Catherine Farley from the New Sarepta High School Parent Band Association. Currently more than 40 students are enrolled in the band program and these funds will assist with the purchase of musical instruments.